Bundle up for some cold weather when the eighth Sims 3 expansion comes out later this year. The seventh expansion pack for The Sims 3, Supernatural, hasn't even been released yet, but that hasn't stopped EA from announcing what's next for the long-running simulation series. 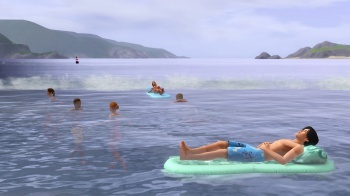 The publisher announced that it would follow up Supernatural with The Sims 3: Seasons, which will add weather and seasonal festivities to the core game. Producer Ryan Vaughan said in a press release that adding seasons to the game was one of players' most-requested features. "The seasonal changes in this game offer incredible realism, simulating nature in a way that is unprecedented for The Sims." Players will be able to control the length of each season, as well as what seasons exist, perfect if you were hoping to create a world of never-ending winter for your Sims. Rainy, snowy, and excessively hot weather, along with the new clothes to go with them, will also be included in the expansion. Additionally, seasonal events will give Sims even more to do. According to the press release, "Sims can snuggle up with their crush and get crowned the king or queen of the spring dance, visit the face-painting booth at the summer festival, bob for apples beside a pumpkin patch at the fall festival or head to the snowball fight arena for an epic wintertime battle." And though they're not exactly weather-related, UFOs and alien abductions will be making their triumphant return to the series. This isn't the first time The Sims has gotten seasonal; The Sims 2 also had a Seasons expansion pack. The Sims 3: Seasons will be released for the PC and Mac in November, making this the first time since The Sims 3 launched that there have been three expansions in a single year.